Have you heard of the hospital fantasy? I’ve known about it for a long while, but just recently learned it has an actual name. When I first started seeing clients back in the day, I was kind of surprised when they’d tell me about their hospital fantasies. Partly that’s because I don’t like hospitals, but that’s another story. Now, years later, not only do I better understand the hospital fantasy (and others like it), but I can see its transformative wisdom too. You learn you have to be hospitalized. Perhaps you had a minor accident or maybe need simple surgery, preferably elective. Nothing terribly dangerous or worrisome, but enough to put you out of commission for a few days, or even a week, if you’re lucky. In your fantasy, this is the kind of hospital that gives you the most excellent care. The staff is kind and attentive, making sure you’ve completed all necessary tests and followups before they give you the green light to go home. During your time in the hospital, you’re free to rest and just be for awhile. And when you return home, you feel remarkably replenished and renewed. There are other versions of the hospital fantasy too. For instance, maybe you wish you could get sick, not with a life-threatening illness but one that takes you out of your day-to-day routine for awhile. You spend your time recuperating on the couch, away from work and other obligations. Or, there’s also the escape fantasy, wanting to run away to something different. Maybe you daydream about being a nomad, living close to nature, becoming a barista or some other kind of radical life shift. When you start to unpack these fantasies, you realize they have a lot in common. Often they show up when you feel anxious, overwhelmed or burned out. Or life feels particularly complicated and hard. They may also rise up when you have a sense that something’s missing in your life, but you’re not sure what it is. Or maybe you do know what it is, but making that change feels radical and risky. And because there is no easy answer to these complex life experiences, such daydreams and fantasies are tremendously compelling. Of course, they’re helped along by the fact that our culture doesn’t exactly champion the need to stop, rest and reflect. Someone (I can’t remember who) once said that illness is the only form of accepted meditation in our society. In some ways it’s a little better now, but in other ways it’s worse, and the expectation that you must always be available to everyone, no matter what, is pervasive and unrelenting. Early on, I thought the antidote to the hospital fantasy was time off. While my clients might not be able to escape from it all, I thought they could probably take a day just for themselves. A whole day. I figured that almost everyone could do that, even though it would require some advance planning and asking for help. I wouldn’t get anything else done. I’d fall behind and it would just make it harder to catch up. It turns out that a day off is just a band-aid when we’re talking about escape daydreams. And I admit, not a very good band-aid at that. We can’t fully understand or try to “fix” these fantasies by using logic and cognitive reasoning, because they originate in our unconscious: the emotional, creative part of our brains. That part of our brain doesn’t understand the logic of taking a day off. It wants much more than that. No wonder my clients reacted the way they did, feeling guilty, worrying about worst case scenarios, believing it would just be too hard to take time off. That’s exactly the way our emotional brain reacts. No wonder the hospital fantasy or the escape fantasy seems more vivid and viable than a day off. Perhaps that’s why we keep coming back to it, because some part of us knows it has a life of its own, and needs to be acknowledged in some way. What the daydream truly wants from us is to go deeper into it. These fantasies and daydreams hold up a mirror to our unlived lives, the opposite parts of us, the parts that are unchosen. They’re much like sleeping dreams, and if we dig deeper, we can discover insights and wisdom that we couldn’t have imagined just by looking at them on the surface. One way you can begin allowing the fantasy or daydream to live is by writing it. Not just writing about it, but writing “as if” you’re in it. 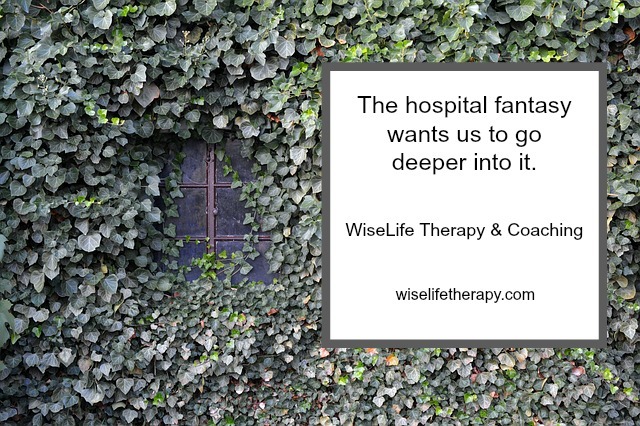 In other words, using your imagination to carry on the story of your hospital fantasy or escape daydream, playing it out, including as much sensory detail as you can. What am I really seeing here? What am I really tasting? What am I really touching? What am I really smelling? Once you’re in the flow of writing, let your imagination lead the way. Give yourself over to it. You might write just once about this daydream, or continue the story, adding other characters as you go along, if it seems like there’s more life in it. At some point, as you’re reading your story, you will likely begin to better understand the wisdom embedded in your fantasy. Personally, it always surprises me how wise my unconscious, emotional brain is. I’m not tentative, I’m here. Here now. I go into a coffee house and I am known or at the very least acknowledged as someone who belongs here, a part of the community. We nod, smile, bonded together in this place we have in common, the love we have for this place. And when I walk down Main Street I feel at home. I am home. The daydream metamorphosed into the opposite of escaping, didn’t it? So go ahead, find the transformative wisdom in your fantasies and daydreams. To do so is a brave, creative act, especially in a world that mostly considers daydreaming a waste of time. But even that might be changing, with more and more evidence that daydreaming is actually good for you. I rely on my lifelong habit of daydreaming to spin my stories.